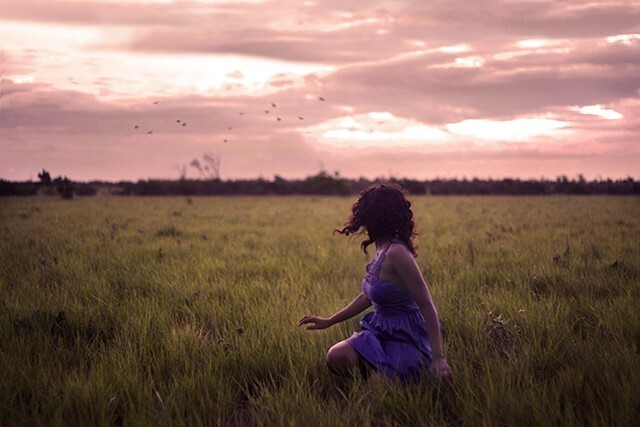 The Robert and Frances Fullerton Museum of Art (RAFFMA), in collaboration with the MexiCali Biennial, will present a new temporary exhibition, “Calafia: Manifesting the Terrestrial Paradise”. The exhibition will be on display Oct. 6 – Dec. 15, 2018. 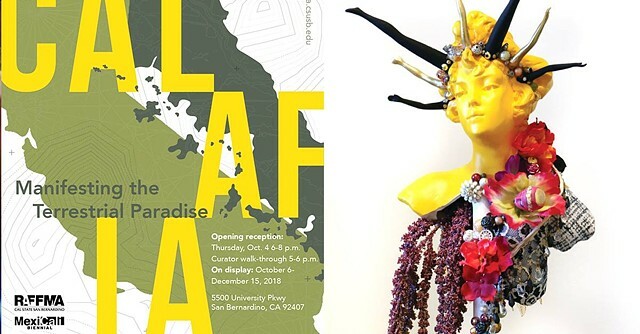 Calafia is a group exhibition featuring 30 artists from California and Mexico that seeks to explore the spirit of California by using the mythological Black female warrior who is the namesake and ruler of the fictional island of California, as a source of inspiration and artistic departure. 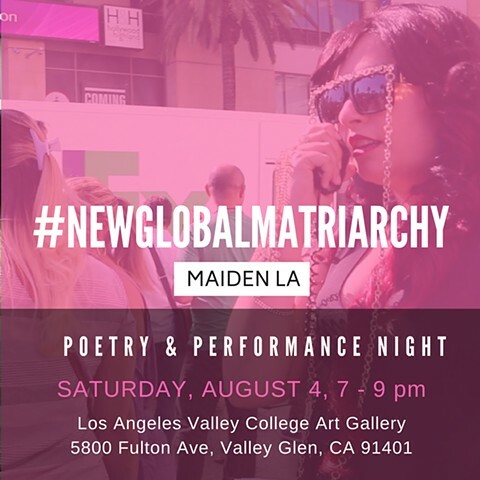 #NEWGLOBALMATRIARCHY is an ongoing transdisciplinary project that was launched by artists Maya Mackrandilal and Stephanie Graham in Chicago in 2016. It embraces collaboration and openness. It is simultaneously funny and dead serious, seductive and antagonistic, critical and celebratory. 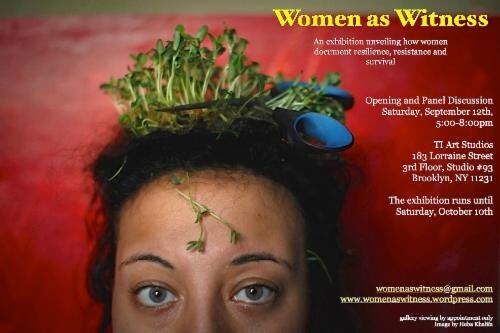 It invites participating artists and viewers to reimagine the past, present, and future as spaces for radical liberatory intervention for women/queer people of color. For this program at Los Angeles Valley College, in conjunction with MAIDEN LA, Mackrandilal collaborated with artist and director Scarlett Kim, inviting artists, writers, and performers to consider gestures against borders. The themes of engagement were broad—the spaces between dualisms (like male/female, West/East, civilized/primitive, self/other, mind/body, etc) and how women/qtpoc resist those borders. 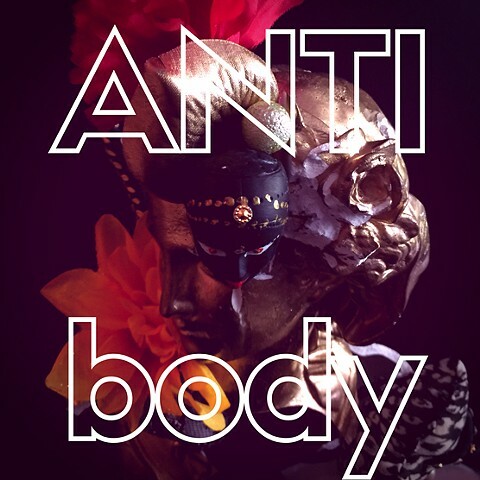 It will be an evening of celebrating the things that the dominant culture sees as most threatening: powerful femininity, queer desire/bodies, open borders, cultural hybridity, poc solidarity, the irrational, non-Western traditions and practices, and more. The program will include durational performance, a participatory art piece, dance, poetry readings, and more. 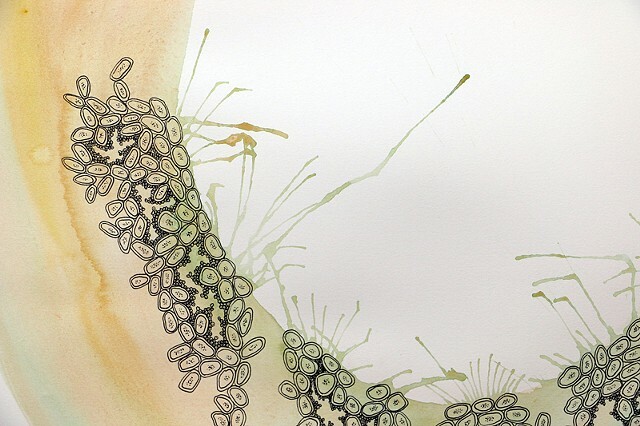 Participating artist include: Paola Escobar, Diana-Sofia Estrada, Edgar Fabián Frías, Scarlett Kim, Seonjae Kim, Maya Mackrandilal, Imani Tolliver, Candy Yi, and others. 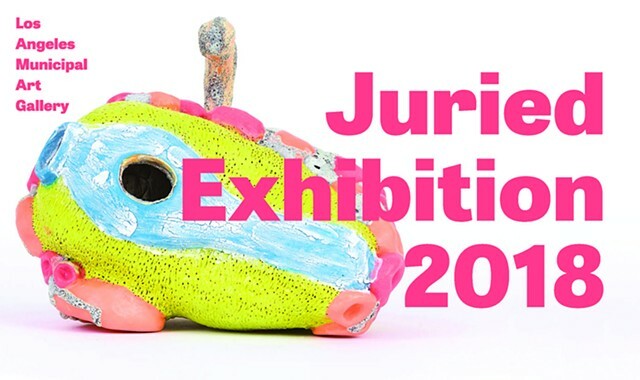 I am thrilled to have been selected for the 2018 Juried Exhibition at the Los Angeles Municipal Art Gallery! Please join me at the opening reception on Sunday, July 22 from 2-5pm. The show will be on view through September 16, 2018. 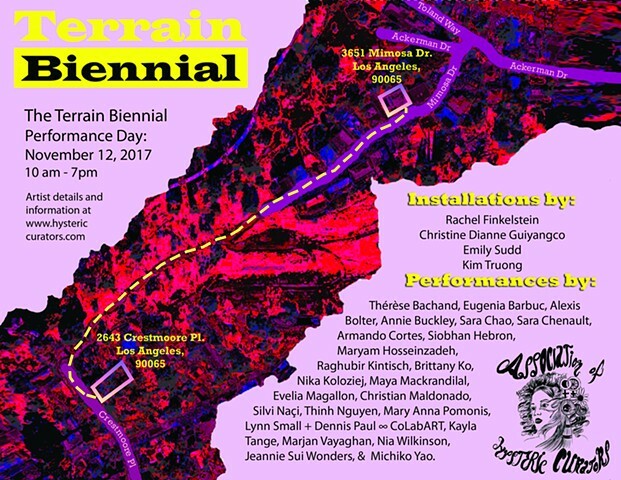 I am so pleased to have been included in the Ana Mendieta Performance Day, part of The Terrain Biennial Los Angeles. The event was organized by the Association of Hysteric Curators (more info here). Brand new work will be on view in Chicago at boundary! The show opens on Friday, September 8 from 6-9pm at 2334 West 111th Place in Chicago's Morgan Park neighborhood. Hope to see Chi-town friends there! For those of you who are out of town, a publication was created for this show that features a few images of the work, along with other recent work and writing. Print copies are available for purchase, or you can view online here. 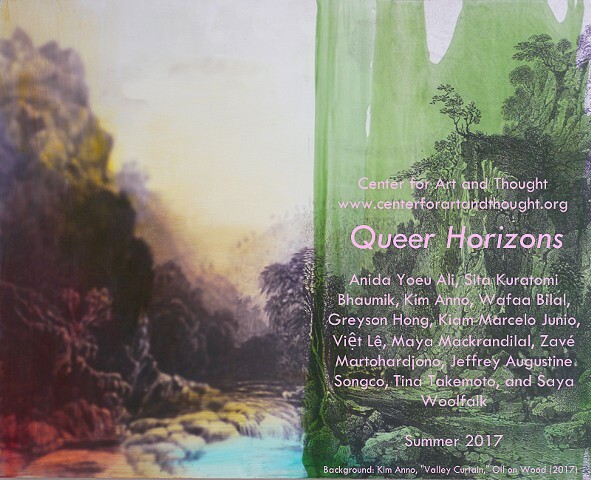 I am so honored to be included in this beautiful online exhibition coinciding with pride month. 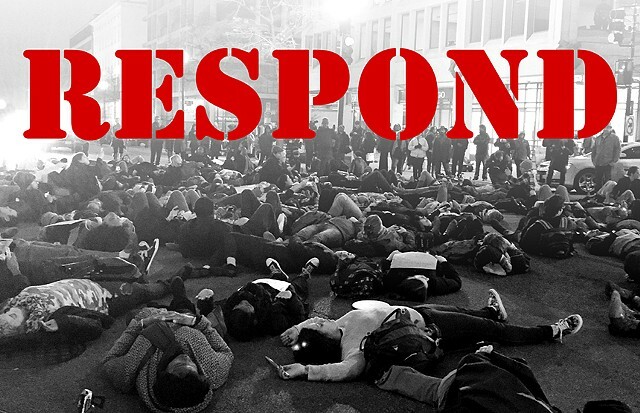 The work included here is beautiful, thoughtful, and necessary. Click here to explore. Very excited to debut a new video titled "knife/woman" at The Petty Biennial in Chicago! The show opened on May 19th and will be up through June 23rd. Click here for info on programming happening throughout the course of the exhibition. The Petty Biennial got a wonderful write-up on Vice.com by Antwaun Sargent including some wonderful quotes from the curators about my work! I am really proud to have been included in a show with so many really great artists. Click here to read it! 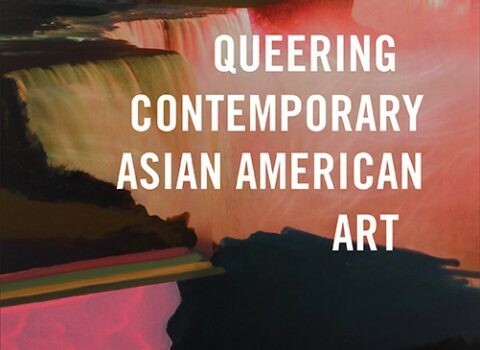 I have been included in a really great anthology of Asian American Art edited by Laura Kina and Jan Christian Bernabe. It includes a lot of interesting work by some really great artists. This would make a great addition to your school or personal library. It is available for purchase on Amazon or The University of Washington Press website. The book now has its own website! Check it out to learn more. Click Here to read a very thoughtful review on artnet. My THUG/LIFE card series will be included in Archival Alchemy - the 20th Annual South Asian Women's Creative Collective group show, guest curated by Saisha Grayson. The show opens April 6, 2017 at the Abrons Arts Center in New York and will be on view through May 10th. Click here for more info! Very pleased to co-chair a roundtable discussion with Alejandro Acierto exploring creative practices, labor, diversity work, and infiltrating (or resisting) institutions and white spaces. You can read more about the conference by clicking here. My "How to Be a Monster" project was selected to be featured on the Dangerous Women Project, an online project housed at the Institute for Advanced Studies in the Humanities at the University of Edinburgh. I wrote a short text to accompany the images that analyzes some of the symbolic elements of the piece. You can check it out by clicking here. So honored to be included in this exhibition, featuring Guyanese artists exploring the concept of "homeland." It will be on view at Aljira, a Center for Contemporary Art in Newark, NJ. The opening reception will be on July 17th and the show runs through September 17th. Please click here for the press release. UPDATE: Siddhartha Mitter wrote a really thoughtful review of the show for The Village Voice click here to read it! The show was also written about in the Guyana Chronicle click here to read it. I am incredibly excited about this upcoming performance at the Chicago Home Theater Festival on Saturday, May 14th! I'll be performing remotely (via the interwebs) as the Goddess Saraswati, doing vol. 2 of "Letters to Whiteboys." The women in this group are extraordinary, so anyone in Chicago should definitely consider attending this event. Act fast, tickets often sell out! You can read about the evening's events, curated by La Keisha Leek by clicking here. Tickets are available here and support the artists. I had a blast as the first interviewee for "Cooch and Cookies" - we had a great conversation about art, life, and #NewGlobalMatriarchy. You can listen to the recording here. I'm so excited about this new series of work created in collaboration with Stephanie Graham. 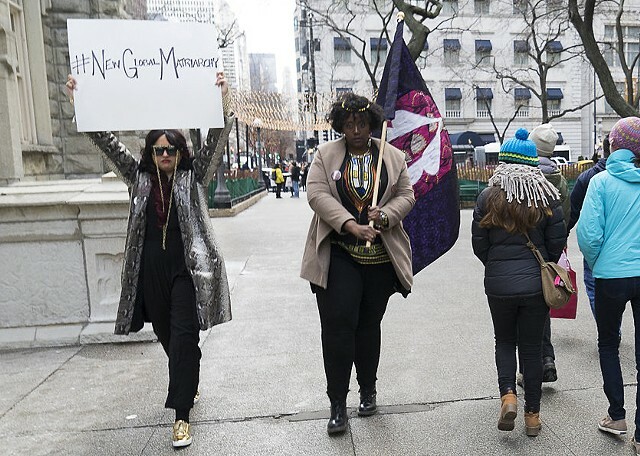 You can catch our installation documenting a recent public intervention featuring Oya and Lakshmi at the Chicago Artist's Coalition, part of "Batten Down the Hatches" curated by Jason Pallas. 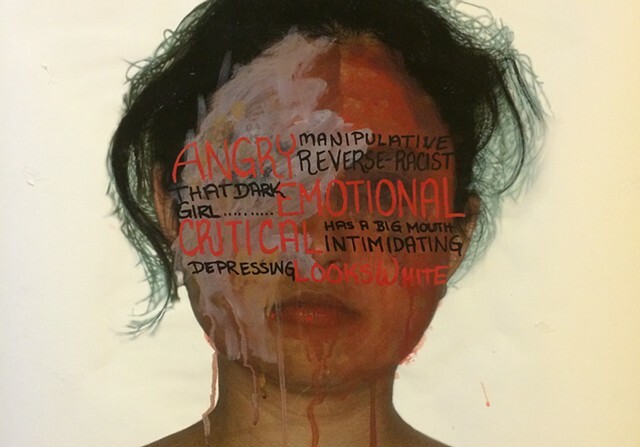 It will be on view through February 25th, 2016. Be sure to check out this interview Stephanie and I did with Hiba Ali over at VAM Magazine! And remember to tune into ACRE TV March 7-13th as this project continues, part of "The Set Speaks"-- a two month long 24/7 live stream from the ACRE TV studios at Mana Contemporary. We made a little promo video about it! I am really happy to be included in this group show celebrating the 150th anniversary of SAIC. Reception is Thursday, January 14th from 6-7:30pm. The show is up through January 30th. 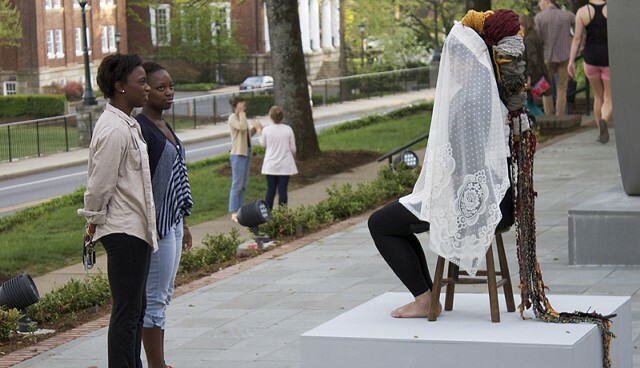 I am pleased to be included in Allison Glenn's ongoing curatorial project at Mana Contemporary with a performance/installation created in collaboration with FEMelanin (a collective of woman-of-color identified performers). 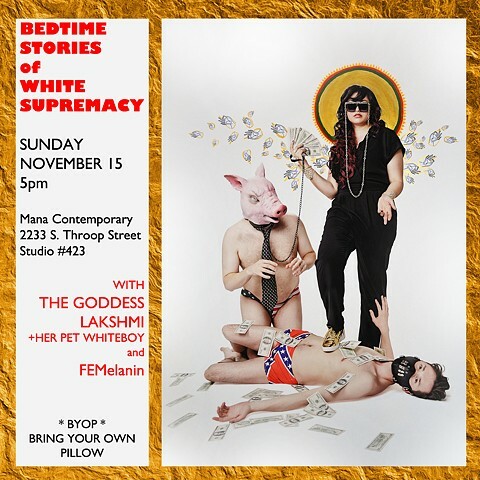 We will be performing at 5pm on Sunday, November 15th. Update: an encore performance is scheduled for 5pm on Sunday, December 20th. Thrilled to be included in Issue #5 of Sixty Inches from Center. Click here to read it! 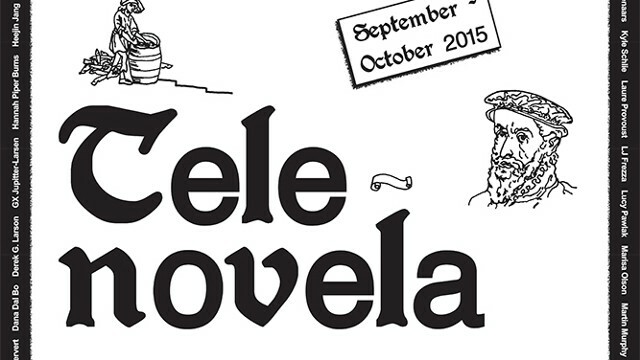 Was included in "Tele-novela" curated by Robyn Farrell for ACRE TV. Really happy to have been selected for this show in Brooklyn. It runs Saturday, September 12 to Saturday October 10th. Gallery hours are by appointment only. Check out the website here. I am pleased to be part of Reference Rot, a three-person group show currently on view at the Chicago Artist's Coalition, part of my participation in the HATCH Residency program. I'm happy to be included in “Flash,” curated by Haley Jung, an exhibition running alongside of the 20th Annual Asian American showcase in the cafe of the Gene Siskel Film Center. Opening reception is Friday, April 3, from 6:00 pm to 8:00 pm. 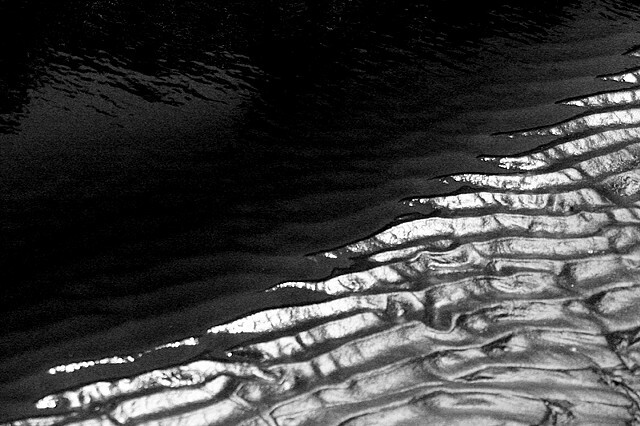 I have created a site-specific installation piece titled Kal Pani at THE SUB-MISSION, the special projects space at THE MISSION gallery in Chicago. The show will run through April 25th, 2015. An online catalogue is available here. Bad At Sports featured Kal Pani as one of their Top 5 Weekend picks! Also included in Chicago Magazine's What's Happening in Chicago Culture This Week. The newest installment from my writing partner and myself is live at 60 Inches from Center, click here to check it out! Really happy that my THUG/LIFE cards were accepted to be a part of this show, which is up through February 22nd, 2015 (click here for more info about the show). Holland Cotter of the New York Times gave the show a great review. 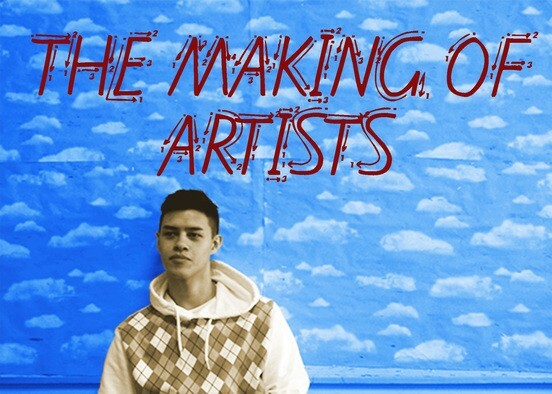 I am an Artist in Residence with HATCH Projects at the Chicago Artists Coalition through 2015. Presented on the panel "Mixed Race Art: Hybrid Identities and Studio Practice" at the Critical Mixed Race Studies Conference at DePaul University. 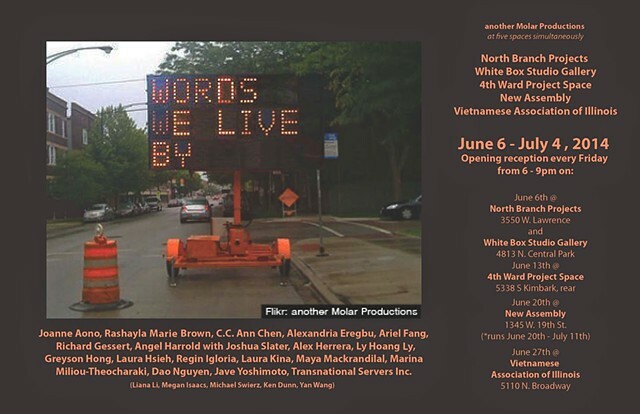 Pleased to be included in Larry Lee's latest Molar Production, my work will be at White Box and North Branch Projects, opening reception for both is June 6th, 6-9pm and check out the openings every Friday for the rest of the month! 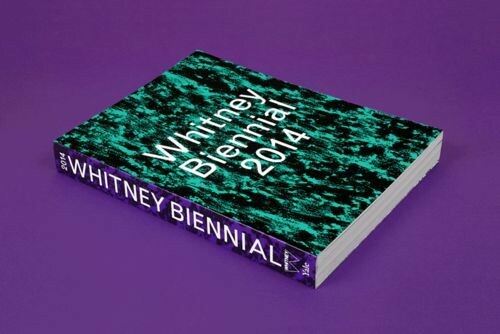 Eunsong Kim and I co-authored an essay about the 2014 Whitney Biennial and race in the art world for The New Inquiry. Read it here. 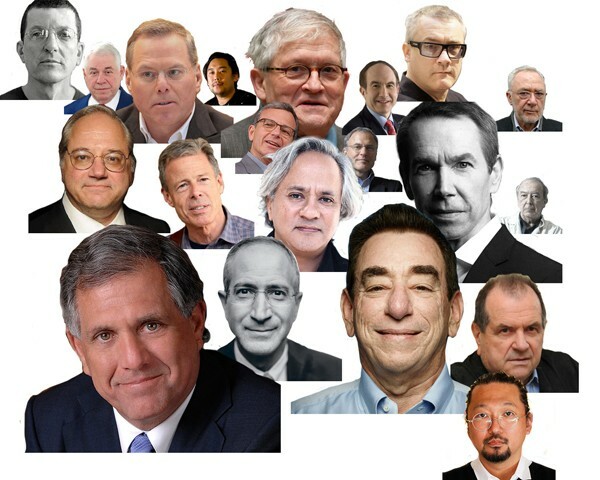 Our essay was also selected as one of the Most Important Art Essays of 2014 by artnet. Happy to collaborate with the amazing ladies of Theatro Luna, a pan-Latina theatre organization in Chicago. You can read about my experience working with them here. You can also read a review of the show in the San Francisco Examiner. 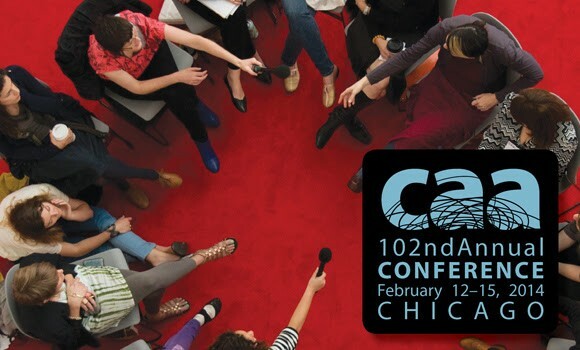 On Saturday, February 15th from 2:30 to 5:30, I will be participating in a panel titled: Miscegenating Racial Representations: Critical Mized Race Strategies and the Visual Arts at the annual CAA conference in Chicago. Click here for full details. Whitney Biennial artist Pedro Velez included part of an interview with me in his contribution to the biennial catalogue (p. 393-394). You can read the unedited version of the interview with Eunsong Angela Kim on my tumblr by clicking here. I will be at the University of Virginia for the Spring 2013 semester teaching Introduction to Sculpture and Intermediate/Advanced Sculpture. I was part of the faculty show in October 2012 titled New Natural History, the invitation can be found here. 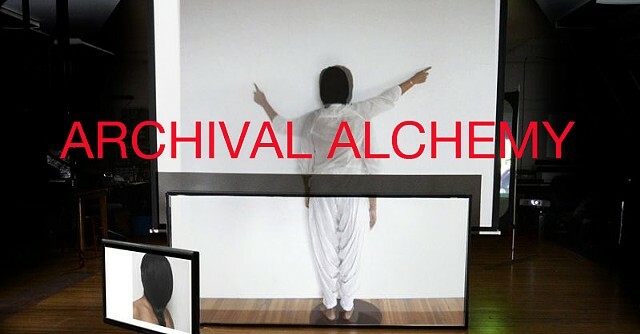 Started a new blog where I will be developing my concept for the performance project I hope to include in the MFA show. It will chart the evolution of the project, my research, thoughts, and hopefully in the future will be a place for viewers to share their experiences of the piece. I've also included the link in the navigation bar. Please feel free to comment on the blog and be part of its development. For some reason this wasn't coming up before, so, here is the press release for the Jacob K Javits Fellowship that I received last year.